1. Increase the microbe population in your soil. 2. Improve the organic matter in your soil. 3. Provide direct macro and micro nutrients to your lawn, flowers, pastures, vegetables, trees, etc. 4. Free up previously locked up, unavailable nutrients that are sitting in your soil. 5. Adds enzymes and growth hormones to improve plant health. 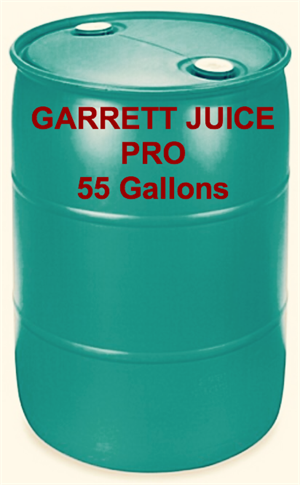 The seven ingredients in Garrett Juice PRO are synergistic, multiplying their effectiveness. Humic Acid: A great source of energy for beneficial soil organisms. Builds stronger root systems and facilitates nutrient absorption. Improves soil aeration and water retention. Beneficial Soil Microbes: Increases the microbe population which improves nutrient availability for the plant. Mycorrhizae: These fungi form a symbiotic relationship with the roots, enabling the root system to better access nutrients. Hydrolyzed Fish: Contains macro nutrients (N-P-K), as well as vitamins, Amino Acids, enzymes, and growth hormones. Liquid Seaweed: Contains naturally occurring nutrients, carbohydrates, amino acids & growth hormones. Molasses: Food for the soil and the microbes. Contains soluble potassium. Apple Cider Vinegar: Brings together the other elements for maximum synergy.